Fly Fishing On Taneycomo Is Still Great! Weather has been good. Maybe not as good as the fishing as we are still battling wind every day, but warm and sunny most of the time. However, I think this is coming to an abrupt end for the next 3-4 days. We are supposed to see ice and snow with a high in the mid 30s tomorrow. Friday looks like cloudy with a chance of rain and snow (50%) and a high around 40. Saturday, cloudy with a chance of rain and snow (again, 50%0 an a high in the upper 40s…..snow won’t stay around too long. Sunday we are still looking at a chance for rain and snow, with lower temperatures in the low 40s. Good news now. Monday through Thursday the temperatures will start warming up. Start out Monday with mid 40 and end up Thursday with upper 50s. Partly sunny each day. Generation continues to be minimal. On the days they are running, it is pretty low. No generation yesterday and again today. Yesterday they started out with a low one, upped it to a low two for a little while then back to a low one. According to the projection, we will have no generation tomorrow. Fishing continues to be great, especially when they are not generating. With the low generation, fishing is still very good, but not quite as good as with it off. Stan had Gary and Stephen on the water this past Sunday. That was one of those low generation days that was outstanding. This was Gary’s birthday present from his wife and it turned out to be a great birthday present! 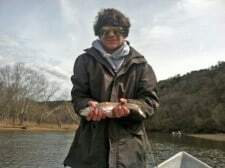 Despite the heavy wind and the fact that the temperature did not get above 40 until 3:00 p.m. good bite all day and lots of fish to the boat on the P&P and ruby midges. Tuesday, Dana had Damon and his father-in-law, Richard, out for half a day. This was the day they increased the flow for a couple hours in the morning before cutting it back to a low. Even with the erratic water, it was a good day for these guys on the P&P, the big ruby and a size 16 red midge. By the way, happy birthday Richard! Jim had Scott and his son Chandler out for half a day. Good day for these guys too on the red midge the P&P and a black midge with gold head. Darrell had a fun day teaching a couple nice young men how to fly fish. Jake and his friend, Eliot, spent Tuesday catching fish on the P&P midge. Good day for these two both in learning and in catching fish. 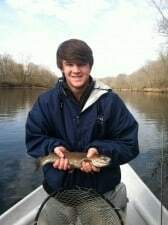 This entry was posted on Wednesday, March 20th, 2013 at 4:55 pm	and is filed under Fishing Reports. You can follow any responses to this entry through the RSS 2.0 feed. You can leave a response, or trackback from your own site.